If a product contains genetically modified corn, it will still be labelled as such in the future, assured EU Agriculture Commissioner Phil Hogan, seeking to dispel fears that consumer protection standards could suffer under planned trade agreements with the US and Canada. EURACTIV Germany reports. 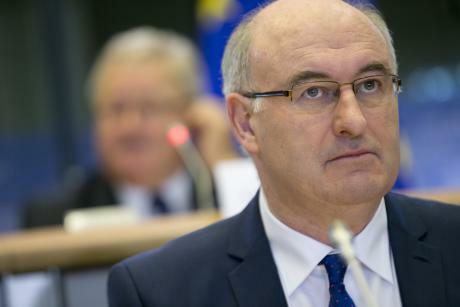 Just in time for the opening of the world’s largest annual agricultural exhibition International Green Week in Berlin on Thursday (15 January), EU Commissioner Phil Hogan took a clear position in favour of labeling products containing genetically modified organisms (GMOs). The Irish politician said he would not allow any compromises with regard to consumer protection standards. Hogan, who took office as Agriculture Commissioner just a few months ago, spoke in an interview with the Süddeutsche newspaper. “We will remain firm on that,” he emphasised. Hogan’s promise came just days after genetic engineering received renewed public attention due to a new EU Directive. On Tuesday (13 January), the European Parliament passed a new Directive on Genetically Modified Organisms. The measure will allow member states to decide to “opt-out”, by restricting or completely banning GMO cultivation within their territories. Until recently, a ban was only possible if health or environmental risks could be proven, explained Vytenis Andriukaitis, the EU Commissioner for Health and Food Safety. The new decision gives EU member states more possibilities to ban the cultivation of genetically modified plants in spite of EU-wide approval, he said. In Germany, the Agriculture Ministry hopes to achieve a complete legal ban on the cultivation of genetically modified foods. The position was announced by the Ministry’s chief Barbara Hendricks, who hails from the Social Democratic Party (SPD). But concerns over the risk of consuming genetically modified products remain high. Critics see the EU’s planned free trade agreements with Canada (CETA) and the United States (TTIP), in particular, as a threat to the GMO ban. This is precisely what the Bundestag’s Green Party faction argued in an assessment titled Free trade – gateway for agricultural genetic engineering. The study is an analysis, conducted by Christoph Then, of the possible consequences of TTIP based on the CETA text. The study concludes that with TTIP, “EU standards for the protection of GMO-free agriculture, such as measures against contamination and maintaining clean seed, will be lowered in the medium-term.” The author also predicts changes in the approval procedure for imported products. Hogan reportedly expressed understanding for consumers’ concerns, “because so far the negotiations have been far too intransparent,” he said. But current Trade Commissioner Cecilia Malmström is in the process of changing this, he assured. “For starters, when the people have understood what is actually being negotiated and which arguments are used, then I am sure that their fears will subside,” Commissioner Hogan said. European consumer protection standards will not be shaken, he indicated. But the European Commission is clear on at least one issue: it will not allow any derogations with regard to the recognisability of genetic engineering. “Only being able to identify a genetically modified product by scanning the barcode on the package, as the Americans are apparently suggesting, is not my idea of clear labelling, nor does it comply with existing rules,” Hogan said. Hogan also emphasised that the indication for regional specialities should remain, even with TTIP. The planned free trade agreement between the EU and the United States does not pose a threat to “Nürnberg grilled sausages” or “Black Forest Ham,” he indicated. “Our system of protected regional indications will not change,” Hogan explained. TTIP is not a threat, the Commissioner said, but rather an opportunity for producers of regional specialities. Consumer protection activists and the Union of Farmers expressed sharp criticism at the beginning of the year. In this reaction, German Agriculture Minister Christian Schmidt said not every kind of sausage and cheese could be protected, if one wants TTIP. Later Schmidt’s spokesman corrected the statement, saying that under the Minister “there would be no Nürnberger grilled sausage made in Kentucky”. The European Commission proposed allowing national cultivation bans for GMOs in July 2010, in a bid to break a deadlock in EU GM crop approvals which has seen few varieties approved for cultivation in more than 12 years. In the EU only one GM crop is approved for commercial cultivation: insect resistant maize, MON 810. This is absolutely true and it does not matter how much EU Agriculture Commissioner Phil Hogan tries to lull people to sleep with bogus promises. We do not want any labels that identify poisoned GMO foods or antibiotics in meat – these goods should simply not be allowed into the EU! The EU bureaucrats like Mr Hogan are running scared because they now have to put lipstick on their CETA/TTIP pig which they themselves created. No to CETA & TTIP! Do not allow more GMOs in your countries. Burn existing crops. Outlaw seed monopolies. Do not underestimate the power of these crops to destroy your healthy soils and ruin your natural crops. We must all fight this fight together against this dangerous seed and food monopoly. Health of soil, soil bacteria, insects, crops and humans are all at risk. Protect yourselves now please. Nearly everyone else in European Union pays for its water so why not Ireland? If it is not from charges it comes from the Central Taxation system.